You can use the Windows Photo Printing Wizard to print your pictures. The wizard offers nearly as many options as the drugstore’s photo counter, printing full-page glossies, wallet prints, and nearly anything in between. Open Pictures from the Start menu and select the photos you’d like to print. Want to print one photo? Then click it. To select more than one photo, hold down the Ctrl key as you click each one. Tell Vista to print the selected photos. Click the Print button from the folder’s toolbar. Right-click the selected photos and choose Print from the pop-up menu. 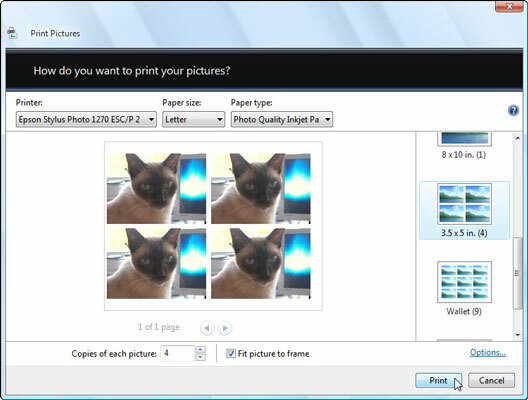 No matter which method you choose, the Print Pictures window appears, as shown in the following figure. Choose how the photos should appear on paper and then click the Print button. Choose your printer, paper, and photo layout and the number of times to print each picture. Printer: Vista lists your default printer — your only printer, if you only have one — in its top, left box. If you own a second printer you only use for photos, choose that printer from the drop-down menu. Paper size: Vista lists different paper sizes in this drop-down menu in case you’ll be printing on something besides normal 8-1/2-by-11-inch photo paper. Layout: Choose how Vista should arrange the photos on the paper. You can print each photo to fill an entire page, for example, print nine wallet photos, or somewhere in between. Copies of each picture: Choose anywhere from 1 to 99 copies of each picture. Insert photo paper into your printer and click Print. Your photo paper must face the correct direction and print on the correct side. Click Print, and Vista shuttles your photo off to the printer.